The BMJ in partnership with and funded by The Health Foundation are launching a joint series of papers exploring how to improve the quality of healthcare delivery. The series aims to discuss the evidence for systematic quality improvement, provide knowledge and support to clinicians and ultimately to help improve care for patients. The Health Foundation and The BMJ share a commitment to improving the quality of health care, in particular the frontline delivery of health services. Over the next year and beyond the series will aim to support clinicians by providing thoughtful and targeted material on key topics in quality improvement, and helping to guide quality improvement learning and practice. The Health Foundation is an independent charity committed to bringing about better health and health care for people in the UK. From giving grants to those working at the front line to carrying out research and policy analysis, the Health Foundation aims to shine a light on how to make successful change happen. • Carl Macrae and Kevin Stewart: Can we import improvements from industry to healthcare? • Billy Boland: How can you know what culture you are operating in, and can it be measured? • Rhiannon Barker, Karen Ford, and Jocelyn Cornwell: What does staff engagement mean in the NHS and why is it important? • John Brennan: What can the QI movement learn from evidence based medicine? • David Oliver: Should practical quality improvement have parity of esteem with evidence based medicine? These articles are part of a series commissioned by The BMJ based on ideas generated by a joint editorial group with members from the Health Foundation and The BMJ, including a patient/carer. The BMJ retained full editorial control over external peer review, editing, and publication. Open access fees and The BMJ’s quality improvement editor post are funded by the Health Foundation. Cat Chatfield is the Quality Improvement Editor for The BMJ and The Health Foundation Quality Improvement series. You can contact her at cchatfield@bmj.com or on Twitter at @drcatchatfield. This quick guide provides an explanation of some common approaches used to improve quality, including where they have come from, their underlying principles and their efficacy and applicability within the healthcare arena. This paper offers a way of viewing the field of improvement from the perspective of the men and women who deliver and co-produce care on the ground - the improvers on whom the NHS depends. It describes 15 habits which such individuals regularly deploy. A series of essays by leading academics exploring the issue of context in improving the quality of patient care. Building on these essays, we published a further evidence review on context in 2015. 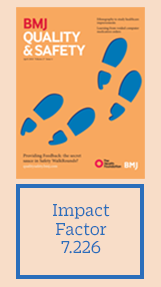 BMJ Quality & Safety provides a rich mix of news, opinion, debate and research for academics, clinicians, healthcare managers and policy makers. It encourages the science of improvement, debate, and new thinking on improving the quality of healthcare. The journal is led by a patient-focused editorial team with a view towards helping all team members improve knowledge with the overall goal of improving patient care. The journal integrates the academic and clinical aspects of quality and safety in healthcare by encouraging academics to create evidence and knowledge valued by clinicians and clinicians to value using evidence and knowledge to improve quality.